Overview: What is sun damage and premature skin aging? Skin ages prematurely from prolonged exposure to ultraviolet (UV) radiation from the sun. In fact, UV radiation is the most important factor in premature skin aging, accounting for about 90 per cent of the symptoms. Chronic, which is caused by the accumulated exposure of skin to the sun throughout a person’s life, producing photo damage or photo aging and, in more and more cases, worrying pre-cancerous lesions and skin cancers. This chronic damage can occur even from sun exposure that does not induce sunburn. UVB radiationis the most harmful type of ultraviolet radiation. It is nearly 1000 times more capable of inducing sunburn than UVA rays. UVB tends to peak in intensity between 11 a.m. and 4 p.m. in summer. While UVB does not penetrate deep into the skin, it can damage the DNA at the heart of skin cells and is one of the foremost causes of skin cancer. UV radiation also irradiates white blood cells, thereby suppressing the body’s immunity. It takes about two weeks for your immune system to recover after a sunburn. Even low or moderate exposure to UV radiation damages collagen fibres, which are the primary structural protein in the skin. Such exposure also causes the accumulation of abnormal elastin, the protein that allows tissue to stretch. With sun damage, large amounts of enzymes called metalloproteinasesare produced. The job of these enzymes is to remodel the sun-injured tissue by synthesizing and reforming collagen. But some of these enzymes actually degrade collagen. As a result, an uneven formation of disorganized collagen fibres develop, called solar scars. As this process is repeated, wrinkles appear. 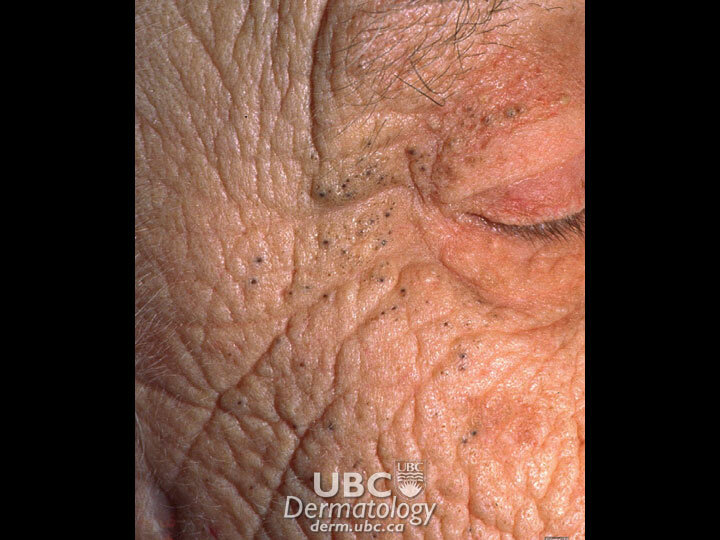 Actinic Keratosis (AK): AK is strongly associated with UV exposure and sun damage, and it is the most common form of precancerous skin lesions (pre-malignant) in humans. The lesions can develop into squamous cell carcinoma [link to skin cancer: non-melanoma page], a form of non-melanoma skin cancer that may ultimately lead to death. Risk factors include being over the age of 40, being exposed to high levels of UV radiation, and having a weak immune system. Basal Cell Carcinoma (BCC): BCC is the most frequent type of human cancer. It is associated with chronic sun exposure and occurs mostly on exposed areas such as the face and the trunk. To read more on BCC, visit the Skin Cancer: Non-melanoma section. Squamous Cell Carcinoma(SCC) SCC is a skin cancer caused by excessive cumulative (long term) sun exposure. These are usualy scaly, non-healing spots on sun-exposed ares o the skin. To read more on SCC visit the Skin Cancer: Non-Melanoma section. Melanoma: The most dangerous form of skin cancer, melanoma is a cancer of the pigment-producing cells of the skin. It can appear as a dark tumour, although this is not always necessary. If untreated, it can spread to lymph nodes and other bodily organs, and it can cause death. The incidence of cancers due to sun exposure has increased dramatically over the past few decades. 90 per cent of all skin cancers are caused by the sun’s UV rays. The rates for melanoma are increasing in both men and women, yet the mortality rate is increasing for men. The fall in mortality in women is apparently due to earlier diagnosis. The closer to the equator you live, the stronger the sunlight is and the longer it shines each day at dangerous levels. Going south for a vacation, therefore, places you at a higher risk for sun damage and accelerated skin aging. Regular application of a broad spectrum, high SPF sun block, avoiding the sun's rays when they are at their most intense (11am- 3pm) and wearing appropriate proective clothing is important. Although the blazing sunlight hours are shorter in Canada, the thinning of the ozone layer creates special problems for us, putting us at greater risk of UV radiation. The farther north you go, the higher the risk of UV radiation, thanks to climatic changes that are reducing cloud and snow cover. Again, appropriate use of clothing and sun blockers is the best policy.